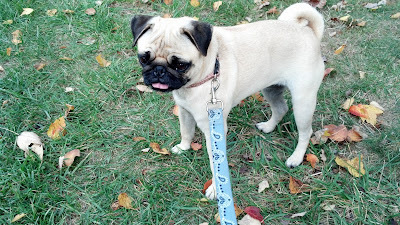 Bah Humpug: Introducing The Newbie - Rosy! So I have some big news...this weekend I picked up a new addition to the family! 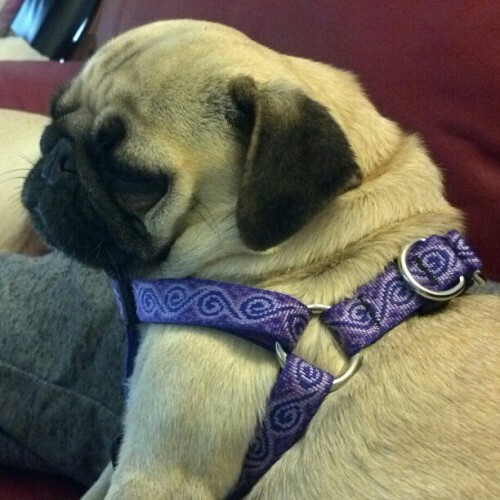 A 2 year-old female pug named Rosy! 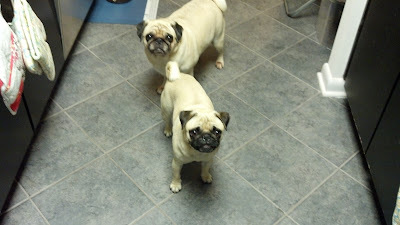 I've actually been looking for another female pug for almost a year but have had bad luck and some disappointments. The young ones go fast! And I really wanted to get a young one so that there's a slight age gap with Sunny. I stalked the local pug rescue's website and Petfinder every day and found Rosy at a rescue a few hours away. I knew she was the one and a few days later I was making plans to drive over and pick her up and welcome her to my home! Rosy is itty bitty! And she's super fit and lean. I'm hoping I can keep her that way but then again, look at Sunny and all her rolls. Sigh, I'll try real hard! 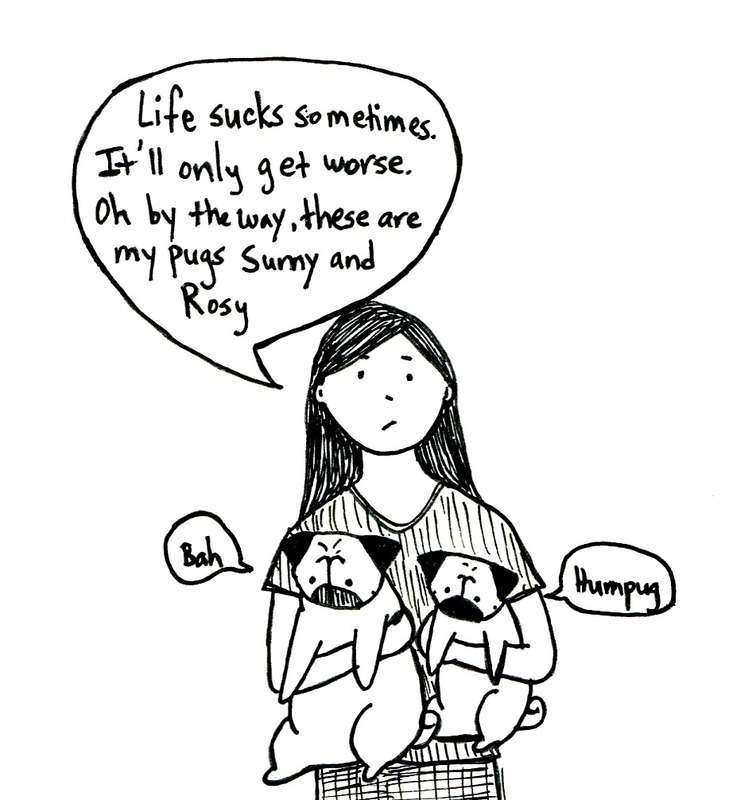 Anyways, I wanted to do a quick illustration to welcome Rosy to Bah Humpug. 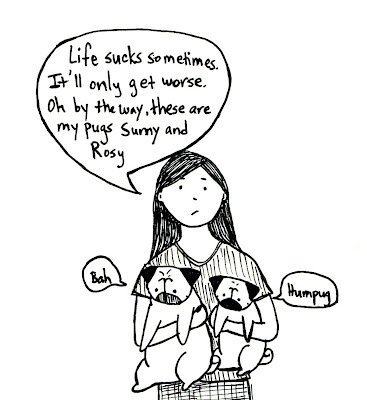 I find it funny how I'm such a pessimistic, cynical, grumpy person and yet I have dogs named Sunny and Rosy! And they both came named that way! 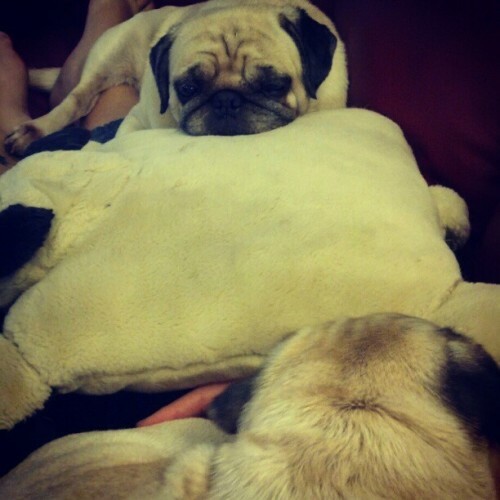 They both had different spellings (Sunny was Sunni, and Rosy was Rosie) but still that's a weird coincidence! I debated whether to change Rosie's name, but once I realized I could change the spelling to match Sunny's I knew it was meant to be. They are after all the happy, bright moments of my days! They are both so adorable! Congrats on the new addition! Rosy has certainly made herself at home. Just one more sign that it was meant to be. Aaagh! They're so pretty! How is Sunny taking the transition? 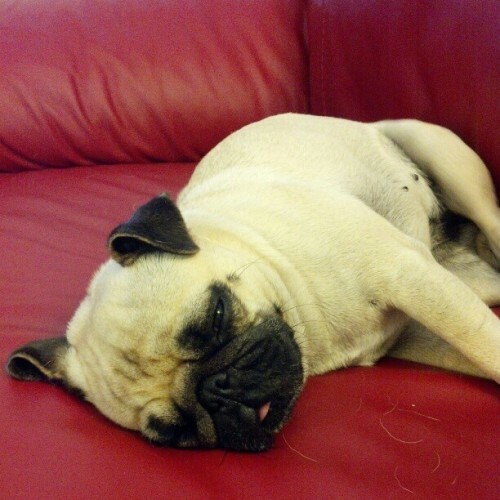 It sure looks like Rosy is taking to her new home quite happily! Congratulations to all of you!! Wonderful news! 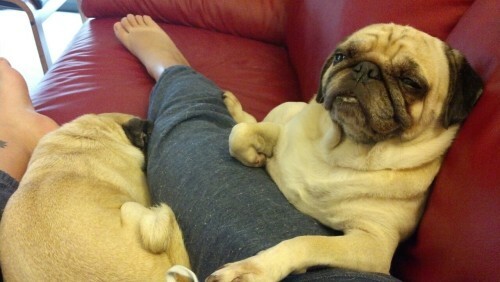 It looks like Rosy has settled in nicely and I look forward to drawings about life with TWO pugs! Yay! Keep the photos coming! I'm sure Sunny and Rosy will keep working things out and become friends. Oh my gosh. How sweet. So nice to have a new family member. I look forward to seeing the new drawings of the two of them. Congratulations on your new pug! Congrats! Rosy is absolutely adorable! 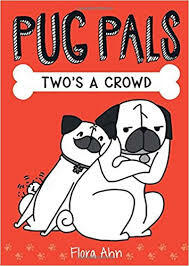 I've always said, "Pugs are like potato chips--you can't have just one!" Congrats on your new fuzzmuffin! She's adorable, and it looks like she'll be a good companion for Sunny. Congratulations on the new addition to your pug family. She's very cute! 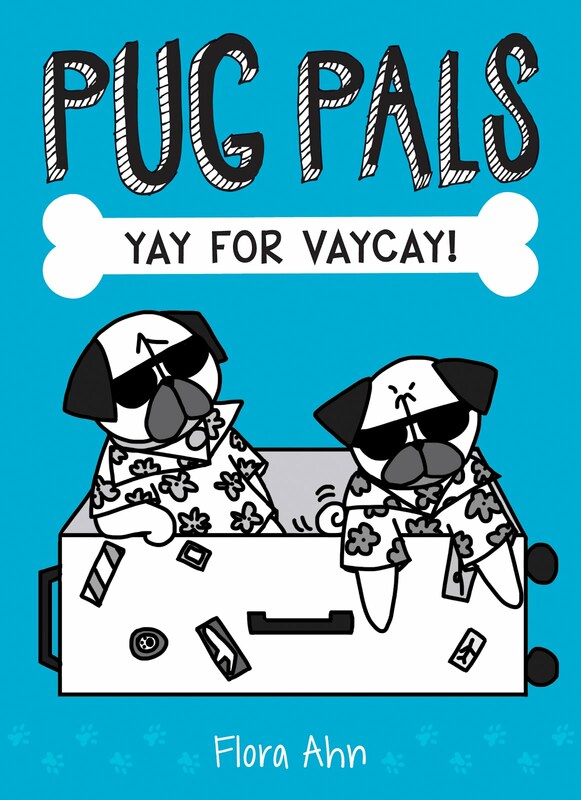 Now you'll have more fun pug adventures to capture and share.